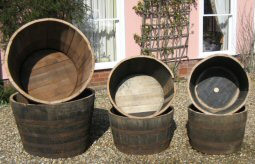 Buy half oak barrels, tubs for the garden. 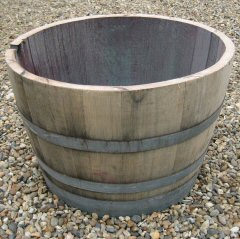 Buy whole barrels & half barrel planters and half tubs. Tip...... After a quick view of the range below click tab 'Order Oak Tubs and Barrels' above to compare. Cut fresh to order and the bands fixed. No carriage charge added! Delivered to your door saving your car, your time and handling. 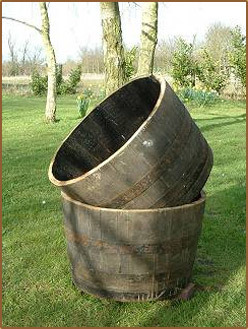 Half Oak Barrel Planters for Your Patio, around the Garden, or for your *Water Feature! Tubs are ideal for floral displays, herbs & other culinary plants, or to restrict plant spread. Unlike other planters these really are frost proof! PERHAPS use one for growing spring onions & one for radishes?......... makes crops so easy to pick. These are approximately 24" - 25" in diameter and 16"-18" in height. They come rustic, freshly cut, and from whole barrels for you to use and finish how you wish! 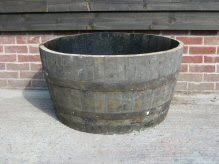 Just £69.95 each planter delivered to your door! Compare prices, as others can add on VAT & a carriage charge at the very end to the basic price of your order ! Our prices are all inclusive prices for almost all UK mainland destinations! Dropped bands? We fix all the bands for you at no extra charge - others do not! WE TRY IF WE CAN TO DELIVER TO YOU THE NEXT WORKING DAY! 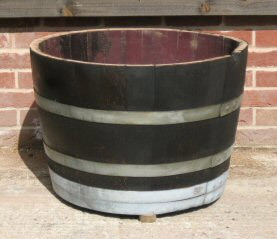 Hogsheads with a top diameter of around 28" at £69.95 delivered (click here to order). and.. Butts with a top diameter of around 36" at £115 delivered (click here to order). Whole Barrels at £159 delivered (click here to order). The Puncheons are not common but are priced at £95 delivered (click here to order). 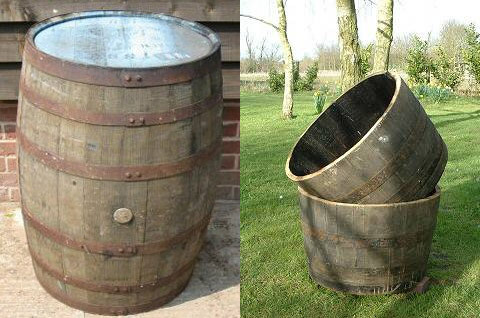 These are an imported brighter looking barrel with a smarter galvanized look. The top diameter is around 27" and they are about 19" high. They are a quality barrel made of quarter sawn oak like the UK sourced barrels. (click here to order from us!). Imported beech hardwood taps available at £24 each. Imported specialised barrel taps available at £24 each. 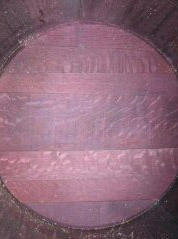 Staining service available for barrels at £4 per 1/2 barrel. IF YOU ARE GOING TO PLANT THE BARRELS UP DRILL ONE OR TWO HOLES IN THE SIDE OF THE BARREL LOW DOWN RATHER THAN IN THE BOTTOM AND THIS WILL GIVE YOU A RESERVOIR OF WATER THAT WILL NOT ONLY ‘FEED’ THE WOOD TO KEEP THE BANDS TIGHT BUT WILL ALSO HELP TO KEEP THE SOIL MOIST IN DRY SPELLS, OR IF IT IS NOT WATERED FOR A WHILE. N.B. SOME BARRELS WILL ALREADY HAVE HOLES MADE BY THE COOPER IN THE BOTTOM. WITH THE WHOLE BARRELS THE BARREL TAPS ONLY GIVE A SMALL FLOW WHEN COMPARED WITH THE MAINS SUPPLY SO PERHAPS USE ONE WATERING CAN WHILST FILLING ANOTHER! *IF YOU USE BARRELS FOR FISH PLEASE SEEK PROFESSIONAL ADVICE.